Hoopla lets Wyomissing Public Library patrons download and stream free videos, music, audiobooks, comics, and eBooks on your mobile device or computer. 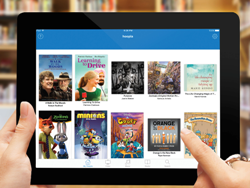 To use Hoopla, you will need to provide your 14 digit library card number, as well as your OPAC PIN or password. If you do not know your PIN, please call the Library for assistance. To use Hoopla on your mobile device, download the Hoopla Digital mobile app. For help using Hoopla, search the FAQs, or email Wyomissing Public Library for assistance.